I have to get a little sentimental here. This is one of my favorite Halloween pictures of all time. I put it up every year and remember the days when the most stressful thing in my life was the fact that Rindi's braids were so much longer than mine! Rindi (on the right) and I (on the left) are as close as two cousins could ever be. She's seen me at my best and my worst and loved me right along through it all. To simply say that she is either my cousin or my best friend, doesn't do our relationship justice. She is both, and so much more. Really more like a sister. I remember the days when "Rindi & Emily" were two words that didn't really get said separately. Whether it was singing "I'm on the top of the world" (by the amazing Carpenters) from the tippy top of our special tree, writing embarassing Reader's Theaters, or playing homemade Double Dare, we were always together. Now that we live miles and miles apart I still see her influence in my life every day. 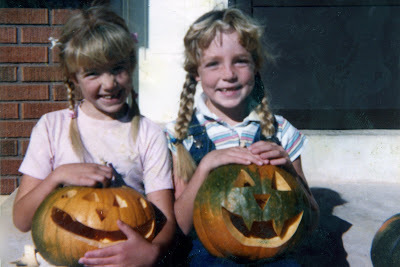 She's an amazing friend and so, like every Halloween when I remember these pumpkins... I miss you Rins, Happy Halloween! P.S. Stay tuned for LOTS of exciting Halloween pictures!